I opened my crates for my Imperial and Rebel Prestige, and I got 4 rewards - 2 Kessen samples for my Rebel, and 3 Kessen samples for my Imperial. I have more 2 bases to check. The devs are just a bag full of dicks. I got the same, three Kessen samples on my main base. 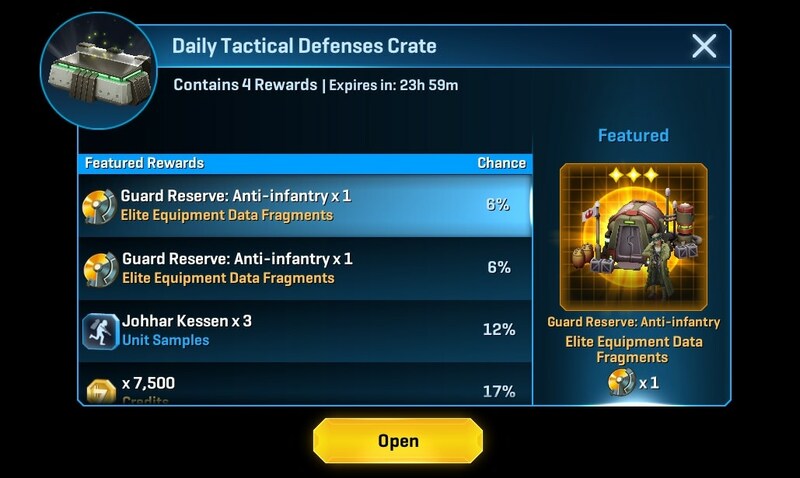 Nothing says tactical defense like a hero sample. They really have fucked us over since prestige came online with giving out frags for anything. The Trend on Er'Kit is off the charts! I'm playing only with my Imperial HQ 6. As I only can play at night for a few hours, last night I went to bed with .93% on Tatooine, and now I'm 1.86% with 24,595 (1,596th) with 1d17h1m to go. I will try to make a few attacks, but I see that will be hard to get what I want: UC on Tatooine, 2 Obsdidian on greens... I'm 8.03% on Yavin, and 15.01% on Tako. Think Obsidian on Tatooine, and 2 Bronzium I on greens is not too bad. My sanity is more important. I'm 0.32% with ~32K gears on Tat, and am closing in on obsidian on Dando. I'd like 30 frags to get the stupid shock trooper gr to level 2. If I get it to 5, it will be equivalent to the level 1 rebel vanguard GR. Yippee! I figured I'd try and get 5 frags from Erkit, but I abandoned that idea because the other planets are moving pretty fast as well. But Erkit is really insane. I wonder if it will set a new record. Has anyone assessed the accuracy of the UCL Trend Analysis in predicting the final UCL? I’ll be off-line most of tomorrow, and would love to be able to log off tonight with some degree of confidence that I’ve reached a “safe” level.